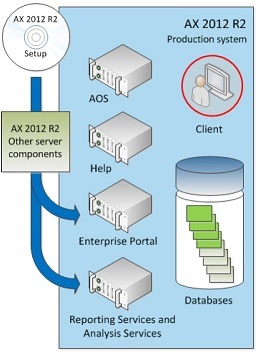 I hope everyone is having a good week so far and that you are ready for another topic on AX 2012 R2. I was reading the AX 2012 R2 upgrade guide and it seems like a lot of information to process. 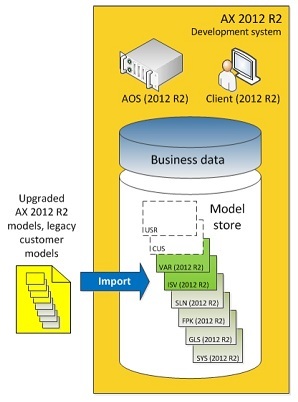 Therefore, I thought on creating a summary of the complete AX 2012 R2 upgrade process through pictures and just a few words. As the saying says, a picture express a thousand words. 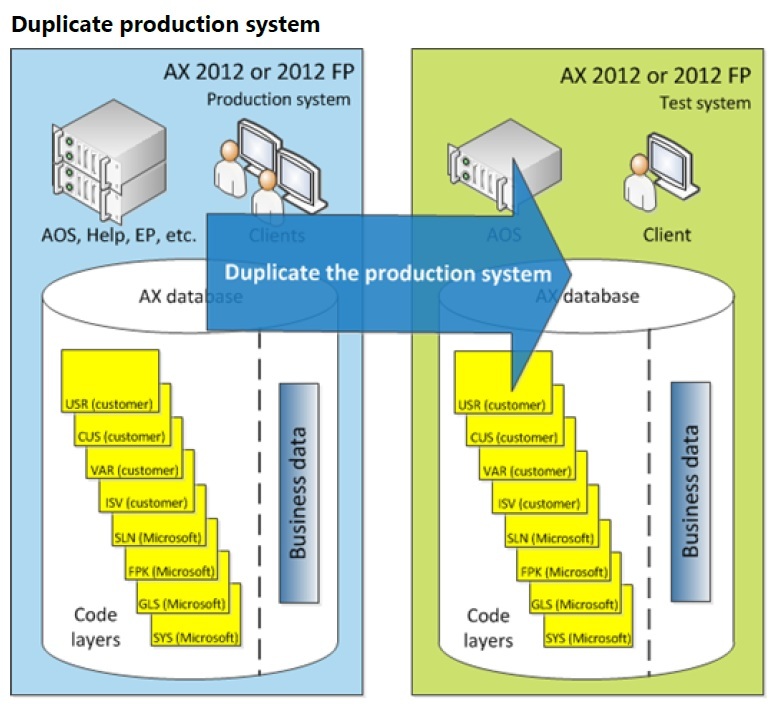 You can download the original document here, which is a very useful guide when it comes to upgrade to AX 2012, AX 2012 Feature Pack, and AX 2012 R2. 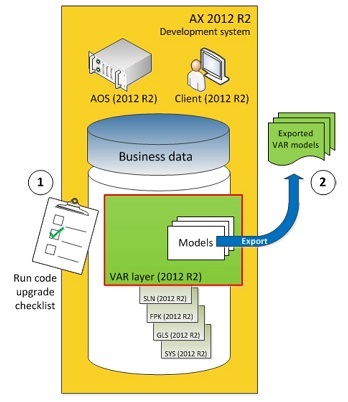 Moving right along, An upgrade from Microsoft Dynamics AX 2012 or Microsoft Dynamics AX 2012 Feature Pack to Microsoft Dynamics AX 2012 R2 is classified as an in-place upgrade. 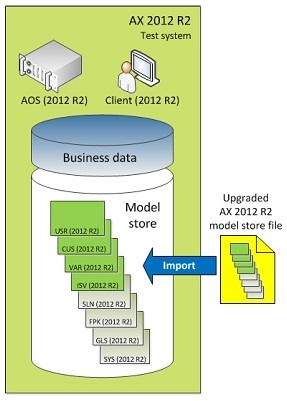 The great thing about this type of upgrade is that it does not requires source-to-target workflow, which is when we needed to upgrade an AX 4.0 instance to AX 2009 before bringing it to AX 2012, instead the upgrade is done directly into the source AX 2012 system, so look for upgrade XPO in your AX 2012 R2 setup files. 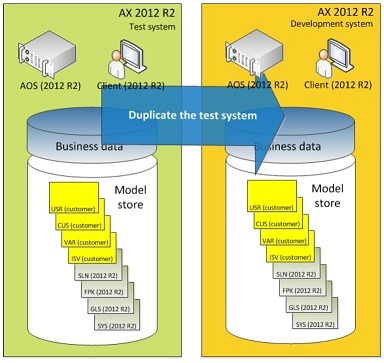 By running Microsoft Dynamics AX 2012 R2 Setup on the test system, you accomplish the three numbered tasks shown in the following picture. Customer models belong to one of the customer layers. 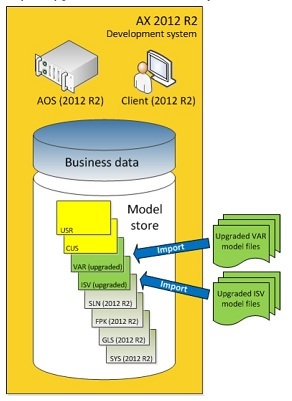 In ascending order, these layers include the ISV, VAR, CUS, and USR layers. Code upgrade is performed by layer, meaning that each customer layer is upgraded separately, starting at the lowest layer and working up through the higher layers. 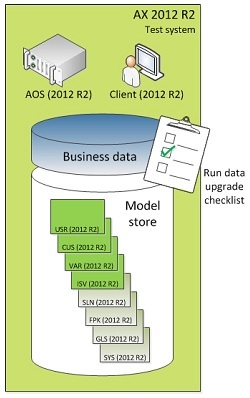 All tasks on the checklist have to be completed for each layer that contains models that require upgrade. 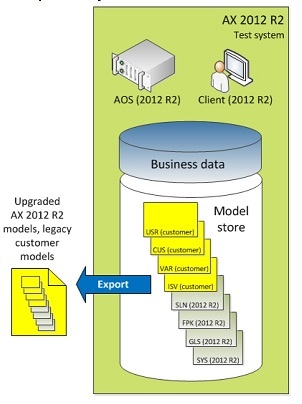 Import the upgraded model or models into the appropriate customer layers. Start with models from the lowest layer, then work up through the higher layers. 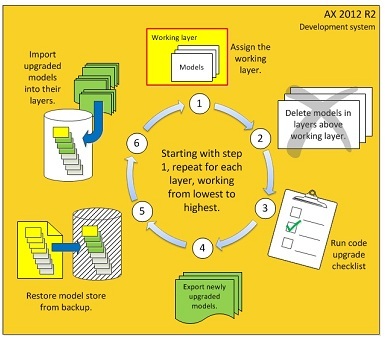 For each remaining layer that contains customized models, repeat the upgrade procedure, moving from the lowest remaining layer to the highest layer. 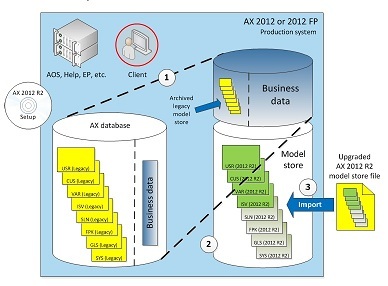 On the production system, enter single-user model. 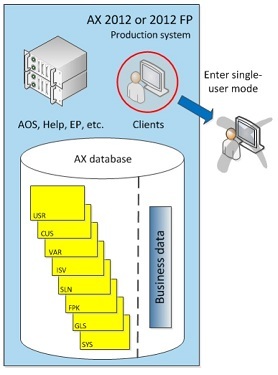 All client users other than the administrator will be disconnected form the Microsoft Dynamics AX system at this point. This action starts the downtime window during which new business transactions cannot be processed. 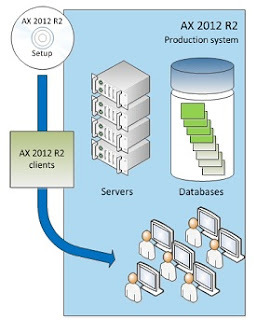 Upgrade on the production system requires that you run Microsoft Dynamics AX 2012 R2 Setup on each computer in your deployment. Run Setup on the production system to upgrade the core server and client components. When data upgrade is completed, you can complete the upgrade of server components. 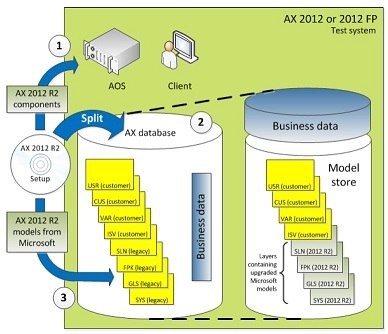 Run Setup on your additional Microsoft Dynamics AX client systems to upgrade the client software. 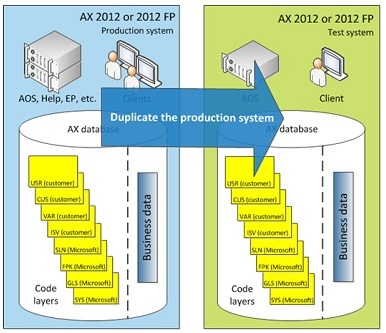 I hope this summary can serve you well as a snapshot of the complete AX 2012 R2 in-place upgrade. There is a lot to learn with this new release and I would expect lots of customer wanting to upgrade to R2 after Convergence 2013. Have a great rest of the week and until the next post. Very Nice post. 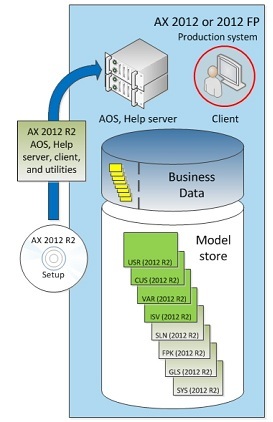 We need this overview when the AX 2012 R2 Upgrades starts to speed up. Thank you for your comment and for checking out my blog. Indeed, a summary is going to be helpful as it will be easier to follow. Have you tried to complete the upgrade, Eduardo? So, Eduardo. 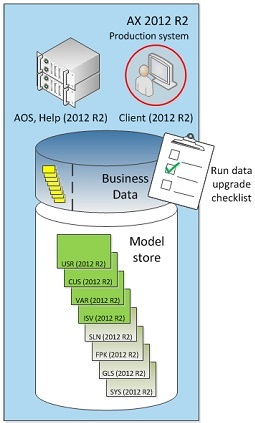 How far did you come in the data upgrade of production? There are some challenges in the areas of product management, attributes to be specific. Instead of using the data migration framework I'm coming up with custom code to migrate this data. Financial info seems to be ok along with Purch and Sales and Invent trans. What's going on on your end? Where do you see the biggest challenge for you is? Nice post and very explanatory pictures! I think that the best recommendation I can give you is to follow the upgrade guide very closely. 50 companies is a lot and you guys must have a ton of data and customization to move over. But I have one question for you. Do you understand the concept of shadow tables and the role of the upgrade cockpit? You have really exemplified the Powerfully Simple with the Power of Simplicity. All those documents are in Information Source, Partner Source and/or customer source. If you don't have access to these, send me your personal email and I'll shoot them to you via email.